Another addition to CPO's compendious survey of Austro-Germanic operetta. In many ways this set embodies both the strengths and weaknesses of both the genre and the recordings. On the plus side we are given complete modern recordings including dialogue and underscoring of works that in the main have fallen from current popularity. The performances are given by musicians steeped in the genre and they have been recorded with CPO's reliably fine engineering. I cannot imagine there being a regular festival in the UK featuring the revivals of works by the likes of German, Novello and Sidney Jones. The downside is that few of these idiomatic singers are world-class and for non-German speakers the often extended dialogue is of near zero interest. Allied to that, CPO do not provide any libretto, simply a relatively brief synopsis. Richard Traubner in his book Operetta - A Theatrical History quotes composer Leo Fall as considering Die Kaiserin his finest work. 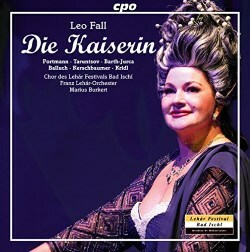 Quite possibly, but it has not remained his most popular - that honour must surely fall (pardon the pun) to Die Rose von Stambul - although this is the fourth Fall operetta on CPO (including Der Fidele Bauer, Paroli and Madame Pompadour) they have yet to record that; Naxos have. Indeed, these new recordings aside the catalogue has not exactly been overburdened with even extended highlights of Fall's work. In the case of Die Kaiserin the 'competition' is from an early 1950s radio source. I rather like the title to the liner essay - "a rococo idyll from an age of iron." Die Kaiserin was premiered in Berlin in 1915 - due to the fact that the Austrian censors forbade the then-Emperor's family being the subject of an operetta. Although based on historical characters and with some effort made by the librettists to be historically accurate the plot is pure operetta whipped cream. Indeed quite how it is stretched out to the 140 minutes of running time I am not sure. In essence the Princess Maria Theresia falls in love with a man beneath her station. Her father and the court disapproves but he shows his metal and the ball that concludes Act I becomes an engagement party. Some years later in Act II Maria Theresia is now the eponymous Empress, there is some Court intrigue based on her husband's potentially wandering eye. In Act III 'proof' of any infidelity is shown to be baseless and in a gentle conclusion the couple embrace as the curtain descends … and that really is about it. As a piece of pure escapism presented at the height of World War I the work's popularity is easily understandable. The score is tuneful and attractive and the central character of Maria Theresia had remained the most popular figure from Austria's ruling family perceived as a mother to both her immediate family and the wider nation. This is not a score I knew at all well prior to listening to this set. The most famous songs have featured elsewhere on recital discs. "Du mein Schönbrunn" and "Da Tanzen Schritt fur Schritt" and other passages, are very attractive if lacking the last ounce of emotional 'pull' that marks out say Lehár's finest melodies. I can fully understand why aficionados of this composer will want every last note written for the work, but for those for whom the highlights suffice, other performers offer more engaging and vocally attractive versions. Both the principal roles suffer from singers who are stronger on characterisation than vocal allure. This is especially true of the tenor Jevgenij Taruntsov who lacks any of the silken warmth and flexibility the great operetta tenors have brought to similar roles. Likewise, the secondary character roles are played to the hilt by singers whose characterisation is no doubt characterful and effective in the theatre but for repeated listening on disc seems affected and even crude. That being said there are discoveries to be made. I particularly enjoyed the Act II finale which features a charmingly naive song sung by the Empress's two daughters (CD 2 track 8) and Fall's handling of the underscoring is unfailingly effective and often moving. Likewise, the secondary characters of Pepi and Bichette make an effective case for their big number "Wenn am Sonntag in der Wienerstadt" (CD2 track 11). Pictures in the booklet imply that this recording was made at a semi-staged concert performance which accounts for a fair amount of clumping around and discreet audience laughter - no applause, mind. The balance between voices and orchestra is good and conductor Marius Burkert marshals his forces effectively if slightly anonymously. By that I mean that there were no moments in the performance where a simple phrase blazed into greatness by the grace or imagination of its execution - this was all perfectly sensible and well executed. Having enjoyed the discoveries to be had in CPO's recording of the lesser-known Lehár operettas I must admit I was expecting rather more of this work. Whether my relative disappointment is a function of the work or the performance I am not yet certain. Curiously, the liner essay - thankfully in CPO's new concise style - expands extensively about the libretto and historical veracity without mentioning the music - and its quality - once. Without doubt this genre benefits from the presence of the best voices and the most affectionate direction. For all the benefits of 'completeness' this new set remains disappointingly mundane.